India conjures up mystical memories, ancient rituals, a past steeped in myth and legend and a country of contrasting extremes. One visit to India is never enough and many, after their first tentative steps to this rich culture, cannot help but return time and time again, experiencing each time new areas and as such new friendships and memories. Chennai International Airport is India's third busiest hub in terms of passenger numbers, after the airports in Mumbai and Delhi. It is the major air transport facility for southern India, dealing with an average of 10,500 international passengers on a daily basis. The travel time into the centre of Chennai from the airport is between 20 and 30 minutes, with a pre-paid taxi from the arrivals area being the recommended form of transport for new visitors. It is also possible to take the train into Chennai, as the Tirisulam railway station is located a short walk away from the airport. Once they arrive in Chennai, holidaymakers will find they are visiting a place with a very different atmosphere to other bustling Indian cities such as Mumbai and Delhi. Formerly known as Madras, it is the country's fourth largest urban centre and the capital of the Tamil Nadu state. The population of the city and its suburbs is estimated at 8.9 million people. 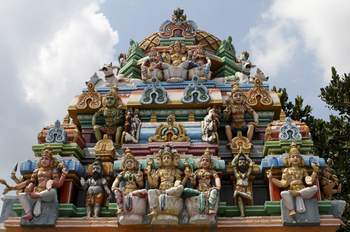 Chennai is often described as the gateway to South India and the city is characterised by a strong emphasis on Tamil culture and heritage, mixed with British influences. This unique blend of the traditional and modern is perhaps the most interesting aspect of the destination for many travellers, as Chennai is a place of sharp and sudden contrasts. The city developed around the British settlement of Fort St George, which was established in 1644. Gradually, the surrounding towns and villages were absorbed to create what is now known as Chennai. 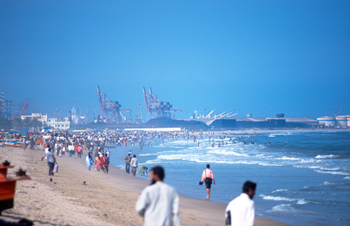 Marina Beach is a highly popular spot for locals and tourists. This 13 km stretch of sand along the Bay of Bengal attracts thousands of visitors, particularly on sunny weekends. There are many shops and food stalls lining the expansive beachfront, as well plenty of opportunities for kite flying, beach cricket and other pastimes. The ancient Kapaleeswarar temple, located in the Chennai suburb of Mylapore, offers a famous example of the Dravidian architectural style. It was built as a shrine to Shiva and is among the city's most recognisable landmarks, offering travellers a fascinating insight into the Hindu religion. George Town, a historical neighbourhood of Fort St George, features many bustling markets for travellers hoping to pick up a bargain from their trip. Wildlife lovers may like to visit the Crocodile Bank, a breeding centre and sanctuary for the endangered reptiles that covers an area of 3.2 hectares. It is one of the largest reptile zoos in the world, with crocodiles of six different species living here, as well as alligators and other reptiles. The Crocodile Bank is located about 40 km south of Chennai. Travellers should prepare themselves for a boisterous greeting when they leave the airport, as arriving tourists are often met by a crowd of beggars, taxi drivers and local people offering to carry luggage in exchange for money. It can be an overwhelming experience, so tourists are advised to keep their wits about them after they touch down. The best time to visit Chennai is at any point between November and February, as the temperature is pleasant and the atmosphere benefits from a cool sea breeze. People will encounter more hot and humid weather at other times of the year.